With yesterday’s launch of Falcon Heavy providing the world a terrific reminder that both space and science are incredibly cool, the developers of Kerbal Space Program have announced a release date for the upcoming expansion to the rocket building simulator. 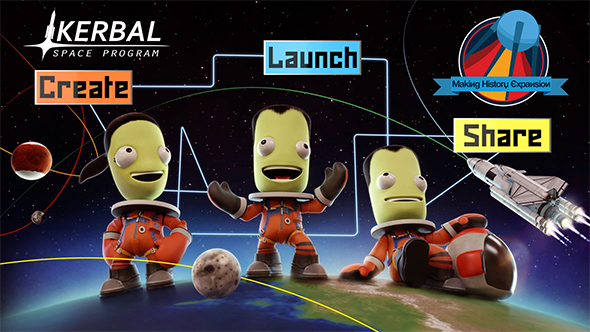 Kerbal Space Program: Making History will release on March 13. Chart the final frontier with the best space games on PC. First announced nearly a year ago, the Making History expansion adds a new mission builder letting you construct custom scenarios. You can set victory conditions and put challenges along the way, covering launches and landings along with malfunctions, repairs, rescues, and more, then share them with the rest of the community. The expansion will also include a pack of pre-made missions inspired by the history of human space exploration, including everything from spacewalking to crash landing. There are also a variety of space race-inspired new parts and astronaut suits. Making History will be available for $14.99 / £9.99 / €12.99, and as promised ages ago, players who bought Kerbal before April 2013 will still get the expansion for free.